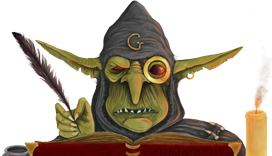 Gitzman's Gallery, the best collection of tools and resources to enhance Warhammer Fantasy Roleplay. This map is HUGE! It's 29,952 pixels wide by 22,528 pixels tall. It includes, with incredible detail, all provinces of The Empire, Bretonnia, Estalia, Tilea, The Border Princes, Norsca, Troll Country, The Dark Lands, The Worlds Edge Mountains, Albion, The Badlands, Araby and more. This mega map was melded together by hours of photoshoping by Gitzman and is a compilation of all available maps into a single continuous, high detail map. Some original artwork is credited to Andreas Blicher, based upon Alfred Nunez, Jr.'s outstanding cartography and research. Many other sources were used including those from the Warhammer Maps page. 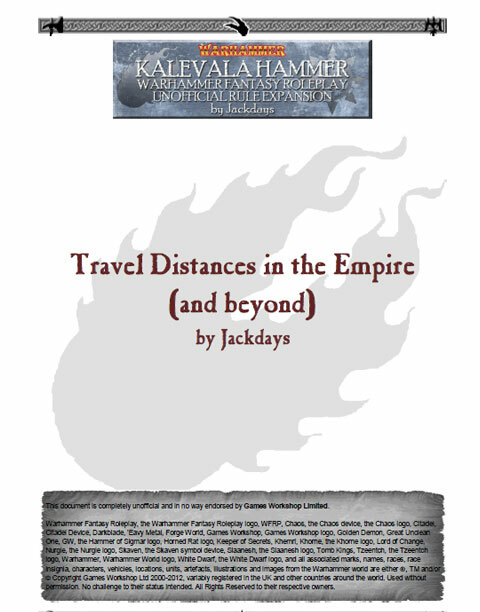 Detailed travel distances from various locations around The Empire. Includes dangerous routes with various risk levels. Land, River and Sea routes. "The Gallery is here to improve everyone's gaming experience. Have something to share? Drop us a line at recklessdice@gmail.com"